I braided hemp twine to make this tieback, then paired it with ready-made tassels. For a shoot last week I borrowed one of those glass lamps that you can put things inside like this one. Love when an object offers you an option to take it to the next level with some styling. 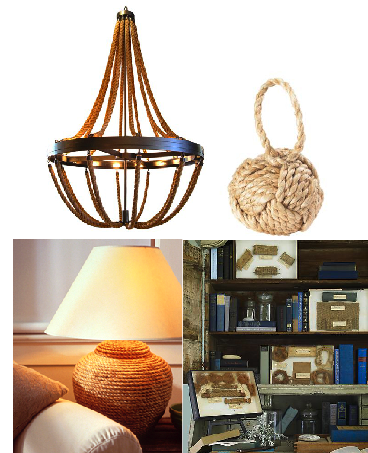 Anyhoo, I went to Lowe's and had a two-foot length of rope cut to put inside the lamp. The dude who cut it was completely baffled by my request: "What are you going to do with this?" My reply: "I'm going to put it inside a glass lamp. It also looks great coiled inside a vase." He looked at me like I had two heads! The rope cost $1.97. You can't beat that price for a little decorative oompf. 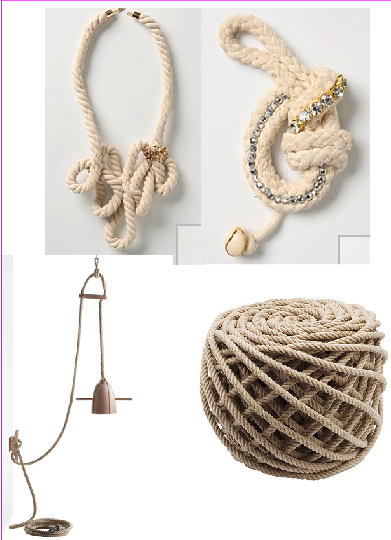 I'd credit Kelly Hoppen for introducing me to the idea of a coil of rope as a decorative flourish. I find it both ridiculous and gorgeous. Clearly the dude at Lowe's thought only the former. Well, I'm here today to admit I am quite obsessed with rope and have been for a while. It all started about 3 years ago when I became determined to install a rope stair rail in my place in Tweed. The back stairs off the kitchen were a real deal-clincher when we bought this place, and from the beginning I was determined to make them a feature. Off came the beige carpet. On went 2 coats of Farrow & Ball Pointing floor paint. Then it was time for the rail. I went straight to boating supply places in Toronto to get the rope -- natural sisal and about 2in thick. I also went with boating hardware to hold the rail in place. The guys who helped me out with the products were fascinated by the idea of what I was doing and really helped me out. Sometimes design is like that -- a great adventure that you can take a few people along on. Love that. So when it came to installation time I knew exactly who to call -- my Dad. He was in the naval reserve as a young man. When I was little I used to play dress-up with the hat from his uniform. He learned to sew (repairing sails) and of course all the knots in the navy. And despite the years that have passed since, hasn't forgotten these skills. He's the one responsible for the very carefully lashed loop you see in the photo above. He's meticulous and I love him for it. The rope ends in a gorgeous coil on the upstairs landing. I'll definitely be getting a shot of it when we shoot the place for STYLE AT HOME in a few months. I have since found a site devoted entirely to stair ropes. It's called stairropes.com (of course). They have the MOST amazing stuff. Here's a selection.